BRIGHTON, Ontario – For most Canadians, now that Labour Day has come and gone, summer is over and to mark the occasion here at Home Goods Online, we are pleased to announce the publication of the Fall 2018 edition of the Merchandiser as well as the unveiling of HGO.tv, our new video blog of vlog, as it were. 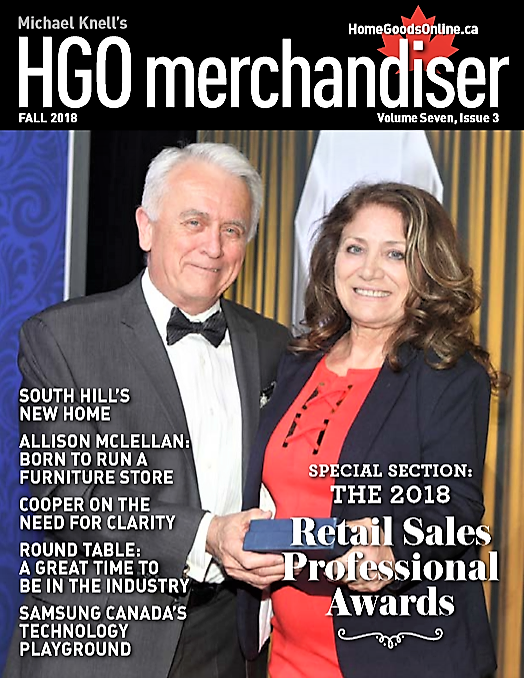 The main event this issue is our celebration of the recipients of 2018 Retail Sales Professional Awards, which begins on page 15. In collaboration with Zucora Home, HGO hosted the second annual edition of the program, whose goal is to seek out the best retail sales people and sales managers working in Canadian furniture, mattress and major appliance stores. 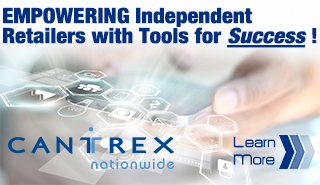 The quality of the response received from retailers across the country was staggering and truly encouraging. The amount of raw talent at work on retail floors from Victoria and to St. John’s must be seen to be believed. Each of the 2018 award recipients was profiled by contributing editor Ashley Newport. We also interview each of the recipients on HGO.tv, which is accessible from the home page or on our new YouTube channel. This issue’s other new feature is our Canadian Furniture Show round table. At the recent CFS, we invited six industry leaders to talk on camera about the state of the industry. Several themes emerged, the most important being that now is a great time to be part of the Canadian industry and the need for independent retailers to adapt to a changing consumer reality – a task for which they may be better suited than their national chain competitors. The video can also be found on our new YouTube channel. In this issue, we also take a look at two retail operations that recently opened new spaces. First, there’s South Hill Home, that moved into a new space right next to its original located at the north end of one of Toronto’s toniest design districts. About three times larger than its old space, the new store really gave this high-end purveyor more room to strut its classically modern stuff. HGO publisher Michael Knell reports on this new space designed to support the needs of a small, but growing furniture retailer. Then we head downtown to the Eaton Centre to view the new Samsung Experience Store, which refers to the space as a technology playground. The company also believes consumers want to experience their kitchen and laundry equipment before buying. Here they can do that. Allison McLellan, who was born to run a furniture store, is our Fall 2018 NexGen (next generation) profile. Profiled by Ashley Newport, this easy-going and passionate manager of – and heir to – a family-owned and operated New Brunswick furniture retailer is still happy serving customers after finding his calling at the tender age of 14. Not to be left out, our retail guru, Donald Cooper, reminds all business owners – whether a manufacturer or a retailer – their first and most important job is clarity. Without clarity, there can be no focus, commitment, urgency or accountability. If he doesn’t or can’t provide it, no one else in the organisation can. He also shares strategies to find it, beginning on page 35. I hope you find it a worthwhile read. Click here to download your copy.